The Event will also be attended by known of name of Dance fraternity like- Rani Khanam ji, Padma Bushan Uma Sharma ji, Nalini Kamlini, Vidha Lal, Geetanjali Lal ji and many other Sangeet Natak Academi winners. Urvashi Dance, Music, Art and Cultural Society led by Kathak exponent and social activist Dr. Rekha Mehra is organizing SAMAGAM - A festival of dance and Seminar on the upliftment of the underprivileged, on the occasion of world health day, 2018. In view of the heightened need for ‘Women Empowerment’ and ‘Saving the Girl Child’, the festival aims to amplify the message of ‘Beti Bachao Beti Padhao’ campaign too. The festival and seminar to be held on 20th - 21st April, 2018 at the LTG Auditorium in Mandi House New Delhi, will be graced by the presence of Shri Vijay Goel (Minister of Parliamentary Affairs) as the honourable Chief Guest. Shri Parvedh Verma (MP), Smt. Vijaya Rahat Kar ( President of National Mahila Morcha) and Shri. Tarun Chug (National Secretary) will also be in attendance as Guest of Honour. Speaking of Urvashi's latest initiative, Shri Vijay Goel, Minister of Parliamentary Affairs says, "It is a matter of pride that this society has always taken initiatives to directly reach out to the lesser privileged citizens. I extend my greetings and good wishes to 'Urvasi Dance, Music, Art, and Cultural Society' for all the success in organising Samagam and all their future endeavours. I am sure this even will go a long way in creating mass awareness and spreading the noble message of 'Beti Padhao Beti Bachao'." “I extend my greetings and good wishes to the ‘Urvashi Dance, Music, Art and Cultural Society’ for all the success in organising ‘Samagam’ and all their future endeavours. I’m sure that this event will go a long way in creating mass awareness and spreading the noble message of ‘Beti Bachao Beti Padhao’. The inaugural performance will be Madhurashtakam ( Kathak) By Dr. Rekha Mehra, Deepak Gangani,and few more followed by Bharatnatyam performed by Disciples of Smt. Sindhu Mishra ji- Aparna Chandnani, Ritika Malhotra, Arshia. Day one will have 90 artist performing on the same stage. Day 2 which is also World Earth day will see Kathak performance by Dr. Rekha Mehra, the act is based on Varsha ( Rain) along with Deepak Gangani, Abhishek Khichi. 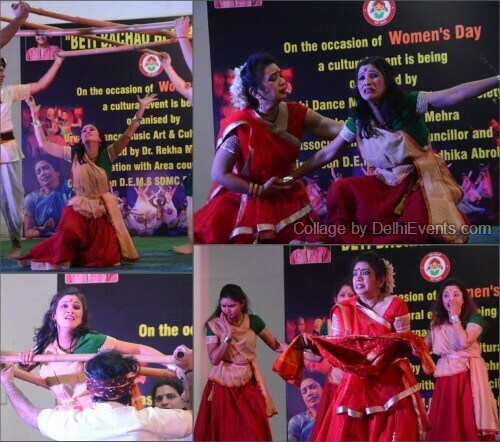 Followed by another Kathak Act based on Nature showcased by Neha Mahawar, Richa Joshi, Pratibha Sharma & Heena. Through these dance Acts, they would like to dedicate these act to Mother Earth. Urvashi Dance, Music, Art and Cultural Society has always been at the forefront in taking initiatives that directly reach out to the lesser-privileged citizens of this great country. In a world where we are faced with increasing social concerns that demand immediate attention, it is imperative to reach out to the society at large and create awareness about these issues that have unfortunately become a part of our daily lives. Earth, the superior mother of all beings occupying it, is also under threat from our irresponsible actions. The environmental crisis can be directly compared to the plight of women today. Urvashi aims to draw parallels between the two and express the pain, anguish, hope and awareness through the medium of dance. Continuing their commitment to the underprivileged, Dr. Rekha Mehra and her team at Urvashi is looking forward to reaching out to a wider audience and communicating the message of peace, love and harmony through an innovative showcase of artistic expression. Headed by accomplished Kathak dancer Dr. Rekha Mehra, Urvasi Dance, Music, Art & Cultural Society serves as an NGO to train underprivileged children with arts like dance, music, tailoring etc. It also provide these children a platform to showcase their talents. The group often performs themed shows and choreographies to create social awareness on several topics like women empowerment, global warming, HIV-AIDS etc. Dr. Rekha Mehra, President of Urvashi Dance, Music, Art and Cultural Society, is multi-faceted Kathak dancer and choreographer from the Jaipur Gharana, who has always strived hard to work for the betterment of backward classes; especially underprivileged children whom she trains sans fee in the hopes of instilling confidence and giving them a better chance at reaching new highs in life. With 35 years of dedication to her art, Dr Mehra is a recipient of several recognitions including the prestigious Indira Gandhi Priyadarshini Award. Her tireless efforts towards promoting traditional Indian culture and heritage through dance directly translates into her wondrous choreographies like Nidaan, Nari Shakti, Atal Shanti Ki Khoj Mein, Kargil Martyrs, and Ladli amongst others.